Review: How fast is Bimber WordPress theme? – Get under 2-second load times on shared magnetic hosting with free plugins and themes. Aggregator websites collect and post syndicated material from around the Web, including news, specialized publishing, or the latest bargains and deals in Internet shopping. Good aggregation helps readers find interesting news and information. It also gives sites they link to added exposure. They are middle men, but they greatly benefit both sides. Aggregator websites are all about monetization. Website monetization is the process of converting existing traffic being sent to a particular website into revenue. The most popular ways of monetizing a website are by implementing Pay per click (PPC) and Cost per impression (CPI/CPM) advertising. There are many WordPress themes that cater to the needs of this niche market. As near as we can tell, there is no free theme that can do all the necessary features. 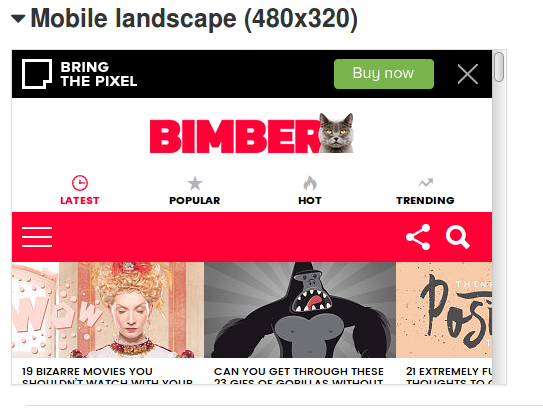 But there are paid themes and one in particular is of interest: Bimber by ThemeForest. Bimber has great Mobile UX. Banner ad appears underneath a top feature, thumb-swipable, horizontal scroll. No scrolling jank from the ad shoving things around as it loads on the page. Very nice. Aggregator websites have resource intensive hogs like Disqus, Facebook, Twitter, Google Analytics, YouTube, Vimeo, Google News, etc. There is nothing wrong with using plugins that may be resource intensive, but you need to balance the trade-off of the plugins’ functionality with the speed and optimization of your website. This requires value analysis. Especially for mobile users. Value analysis includes the following: combination, simplification, elimination, standardization, and substitution. This is strategic performance optimization. A value analysis audit examines every requested component and it’s contribution to site goals. This requires setting self-imposed limitations. Aggregator sites are seductive for adding too many features in the hopes of perfecting revenue. Perfection has too high of a price. Metrics need to be evaluated. Only 20 percent of assets provide for 80 percent of the profit-producing features. Bimber theme is touted as a lightweight aggregator theme. Their marketing says they are a “viral & buzz theme.” Those are unmeasurable, unregulated advertising claims. How fast is “lightweight”? Viral and Buzz are jargon, weasel words. This diminishes their credibility. Test results for Bimber speed reports vary depending upon the date of the test, the location, and the testing tool. Times ranged from best-case 1 second to worst-case 5 seconds. that is quite a spread. And page weights varied from 830k to 1.7M. Again, a big spread. So testing conditions with changing parameters render objective benchmarking a flop. It’s hard to say if our performance goal of a 2-second load time is achievable especially internationally. The average Internet page weight today is around 2.3M. None of these test reports used a demo page of that size. It also appears that aggregator sites are above average in page weight with above 4M of files. This diminishes the prospect of good speed (under 2 seconds) for mobile users. Bimber is frequently featured on articles dedicated to fast WordPress themes. Fast, of course, is relative. Another recent 2016 test claims the Bimber theme loads within 1.5 seconds. (Pingdom score 84/100 to Amsterdam, Netherlands), Page size: 1.7MB, 83 requests. Bimber demo framebuster code won’t allow testing on browser-based iPhone simulators. Or on Yslow. So we couldn’t get results there. Yslow tests would have revealed how much lazy loading of assets were really occurring (if any). About those HTTP calls: there were only 47 to 83 requests on these tests. That doesn’t represent the hundreds of usual HTTP requests that occur on a normal aggregator website. This demo is a best-case scenario. Or a mock-up dummy. Bimber’s advertising page claims the theme is optimized for Google PageSpeed. We couldn’t care less about this test claim. But we ran the demo page anyway for verification. We got the usual frustrating, boiler-plate, error messages this lame test usually produces for WordPress sites. The scores are meaningless if the page loads in 5 seconds. Google doesn’t even use PageSpeed scores in it’s own ranking algorithm. Instead, Google uses Time To First Byte (TTFB). Bimber can get good time to first byte under the right conditions (322 milliseconds). That depends most on the hosting service. Our own Bimber PageSpeed Insights test results. We know those things are being done as best as possible. This is a sales demo after all. What is of more benefit is testing with WebPagetest.org. Ironically, an open-source tool also sponsored by Google after a buyout. Fully loaded: 1.7M, 5 seconds cleared, 3 seconds primed. This data shows the demo is “lazy-loading” about 400k of assets. But they are not using a lazy-load plugin. It may be part of the Google CDN feature or built-into the theme. We’re not sure. Most (half) images are stored in the media library. The most important thing for SEO is Time To First Byte. Bimber TTFB is only 322 milliseconds (very fast) when hosted on a faster NGINX server (not Apache based). But this speed number only influences less than 1 percent in the Google algorithm. Relevant content will always superseded speed for ranking. Speed is not a significant SEO factor. It’s a major UX factor. The Bimber demo uses two free plugins from the WordPress plugin repository. Free plugin so people can reach your content more quickly from search results. If you use WordPress SEO by Yoast plugin version 1.6 or newer, you don’t need to use this plugin, as this feature has been included in the version 1.6 update. After activating the plugin you only have to “Wait for Google Search algorithms to identify your site as a candidate for the new sitelinks search box”. This is a popular plugin (over 1 million installs). Some people swear by it. But from our tests, we’ve never had improved speed results on a well-optimized site. The demo is successfully using WTO plugin for minification and content delivery network support. But other alternatives exist. Note: W3T caching plugin wouldn’t be our recommendation. The most raved about caching plugin is WP Rocket. It’s a paid plugin we’ve never tested. And never will because all our tests of other available caching plugins reveal they only help improve speed if your site is grossly bloated. If the page is well optimized, there is no improvement whatsoever with caching plugins. At least, 1.5 to 2 second load time delay is for Facebook API JS libraries connections and calls. Out of 5 seconds total Facebook is a huge problem! JS and CSS are minified and concatenated. This improves speed and is most likely being done with the W3T plugin. The demo uses GStatic CDN (Google) to offload JS/images/CSS – and probably fonts. But mainly images. There are some blogger complaints that GStatic CDN does NOT improve performance and actually slows down page loading. It would require benchmark tests. We see CDNs as band-aids for sloppy web design. About 1M of images on the Bimber demo page could have been compressed further by 379k (almost 40% reduction in file size — visually lossless). The speed gain would be less than a second – but worth it. 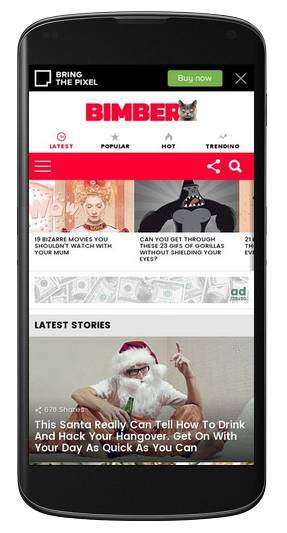 The demo page uses the Google viewport meta tag which means the content is optimized for mobile content. A viewport controls how a webpage is displayed on a mobile device. Without a viewport, mobile devices will render the page at a typical desktop screen width, scaled to fit the screen. Setting a viewport gives control over the page’s width and scaling on different devices. The demo uses built-in Aggregation Functionality plus Pingbacks, RSS, Really Simple Discovery, and Window Live Writer Support. All of these things cause “drag” because they are offsite calls for assets or code. We don’t know if the following are standard Bimber theme features or not: The demo also uses Open Graph Protocol (supported by Facebook). And Twitter Cards for linking content to Twitter. These cause drag. Bimber uses “scrset” in their theme code for adapting images for high- and low-resolution displays. (Good for iPhones and iMacs). Bimber theme has all the bells and whistles any aggregator business would love to have. It’s mobile UX is superior. It’s $49 price tag is cheap. To get load times below 5 seconds will take work. In the final speed analysis, every single HTTP request must be evaluated for contribution to site value. Next PostNext The best lightweight plugin for deactivating XML-RPC to improve WordPress security.